We did a real experiment. 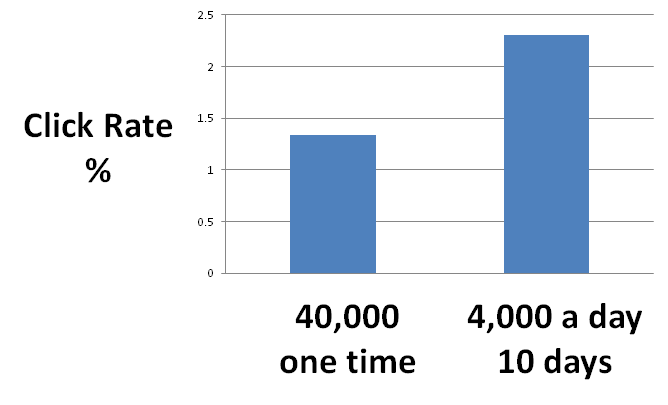 We sent out an email campaign to ~4000 emails a day for 10 days (Total number is roughly 41000 emails). The overall open rate is 22.8% and the click rate is 2.3% (with standard error 0.16). Two weeks later we sent our an email campaign to 40,000 emails at once and got 14.93% (open rate) and 1.34% (click rate). You may wonder – maybe the 2nd time usually has a lower click rate. This is not true because we actually had 1000 emails sent a day before the 40,000 campaign. These 1000 emails are also from the original pool. The click rate for this 1000 email campaign is 2.6%. Besides higher click rate, sending consistent smaller volumes over time may avoid being labeled as spammer. One characteristic of spammer is that they send out emails in a spike pattern: a large volume for one day, then 0 for the next month. It is better to spread the sending volume if the emails are not urgent.